Albert Pujols hits a 3-run homer, the 610th of his career, breaking a tie for 8th on the career list with Sammy Sosa to become the all-time leader for home runs by a non-US player. For Albert Pujols, the home runs keep coming and the records keep falling. The Angels slugger hit a three-run homer on Tuesday night, the 610th of his career, breaking a tie for eighth on the career list with Sammy Sosa to become baseball's all-time leader for home runs by a player born outside the United States. 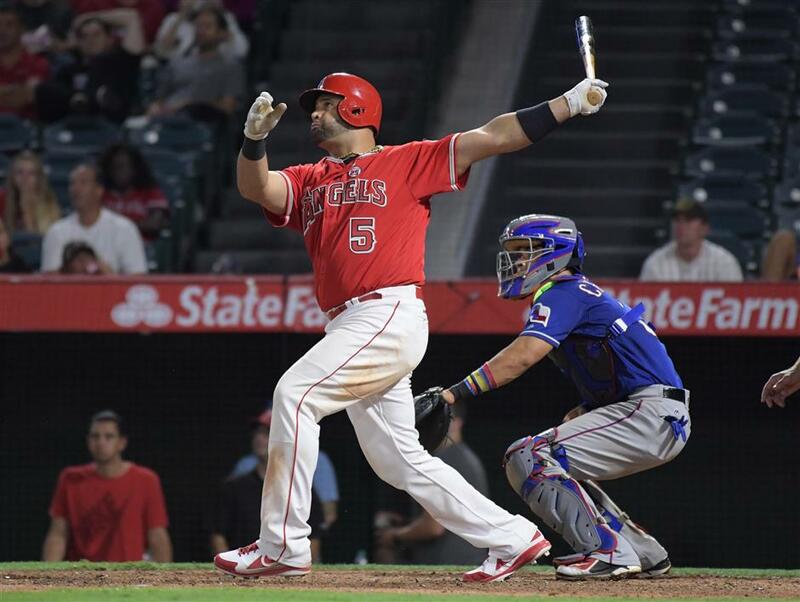 Los Angeles also got a three-run homer from Kaleb Cowart, pummeling the Texas Rangers 10-1 to keep the Angels a half-game back of the Minnesota Twins for the second American League wildcard. Pujols' record home run was his 19th of the season. "It's pretty special," Pujols said. "Obviously, all the great players from the Dominican Republic, Latin America, Venezuela, Mexico, Colombia, they've gone through the big leagues and to be able to accomplish something like this is very humbling." Rangers right-hander Tyson Ross (3-3) allowed three runs and seven hits in 3 2/3 innings. Los Angeles righty Ricky Nolasco allowed a run over 4 2/3 innings, and Keynan Middleton (5-1) followed with 1 1/3 scoreless innings for the victory. The Angels have won 10 of their last 13 games and pounded out 16 hits on Tuesday. Cowart's home run came in the fifth to give the Angels a 6-1 lead. It was his third home run of the season. "We had a really good offensive game," Angels manager Mike Scioscia said. "Even starting off where we left some ducks on the pond, but we came back and really got some clutch hits." The Rangers got nine hits but left 10 runners on base. "We managed some baserunners, but kind of that nemesis of ours, the offense gets tough for us and we're incapable of coming up with the big hit," Rangers manager Jeff Banister said. Pujols hit his homer in the seventh against right-hander Nick Gardewine, who was making his major league debut. The three runs were unearned because of an error by shortstop Elvis Andrus. As impressive as his power numbers are, the Angels are almost equally impressed with Pujols' work ethic. "He's accomplished so much, I think at some point he'll reflect on it," Scioscia said. "He passes great names every time he hits a home run. "But right now I think Albert is just consumed with helping us win. He has great pride to go out there every day and play hard. He understands his numbers, even though he never chases them. He just plays. And that's what makes him special." Los Angeles Angels designated hitter Albert Pujols follows through on a three-run home run in the seventh inning, as Texas Rangers catcher Robinson Chirinos watches, for his 610th career homer to move into eighth on the all-time home run list, overtaking Sammy Sosa, and the most by a foreign-born player, during their MLB game at Angel Stadium of Anaheim in California on August 22, 2017.